How to Prevent or Reverse Gray Hair back to Natural Color? Are there any effective ways to prevent gray hair? 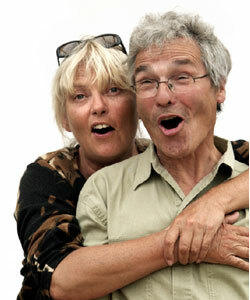 Hair typically turns gray as a result of the natural aging process. The pigment in the hair shaft comes from cells (called melanocytes) at the root of the hair. These cells create pigment (melanin) but during the aging process, they start to make less pigment until the hair has little or no color at all. A report posted on the journal Science by the Boston-based Dana-Farber Cancer Institute explain: What actually happens during the graying process is that the melanocyte cells not only become depleted, they also make errors as they age, turning into 'fully committed' pigment cells that position themselves in the wrong part of the hair follicle, thus leading to a loss of pigmentation. In a May, 2004 Dr. Bruno Bernard, who led the research for French cosmetics giant L'Oreal, announced that his team had identified a pair of genes that may play a role in hair turning gray. Dr. Bernard said that much more research is needed but that findings could lead to a new gray hair solution in the form of pills or topical treatments. In other words, his research could some day help prevent gray hair. During 2011 another story leaked that L'Oreal started a new development in "nutricosmetic" to create a pill that can prevent gray hair. Other experts in dermatology field believed that development of the pill could have potential side-effects on skin and body organs. On March 2016, the first gene identified for graying hair has been discovered by researchers at University College London, confirming graying has a genetic component and is not just environmental. This discovery could lead to creating drugs that could switch this gene off. Leading Japanese cosmetics company Shiseido announced on July 23, 2004 that its research group, working in collaboration with Kirin Brewery, has discovered a unique property of an extract of hops. The research shows the hops extract helps activate the melanocyte cells that generate hair pigment. Furthermore, the hops can control Microphthalmia-associated Transcription Factor (MITF), a gene involved in the activity of melanocyte cells. During 2008, dream turned into reality. Shiseido Laboratories in co-operation with Joico brought a new light into anti-aging hair category by introducing "Re:nu Age Defy" system. 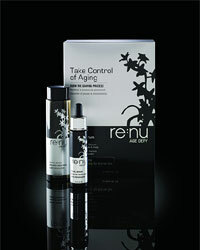 Tests indicated that regular use of Re:nu products result in noticeable reduction in the rate of gray hair growth. The actual product that target gray hair is Re:nual Serum. Contains a series of extract such as Ginseng, Sansho pepper, and Hops extract. With Two Tablets a Day! It seems that US company Melancor made this breakthrough long ago. The nutraceutical researcher and developer announced a new product and new information about the cause and treatment of thinning and graying hair. Melancor-NH is an oral treatment (two tablets a day). 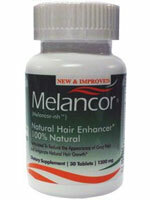 Melancor-NH can prevent gray hair and male pattern baldness. Most people see results in 3 - 6 months, in some cases up to 9 months. Success rate: According to Melancor this product does not work for everyone - the success rate is about 78%. increases your bodys ability to produce melanin pigments, thereby improving its ability to prevent gray hair and restore your natural hair color. Side effects: According to Melancor, 2% of people using this product reported some nausea or headache. Food and Drug Administration approval? It seems that Melancor-NH is not required to have USFDA approval because it is based on natural ingredients (a blend of nutrients and herbs). This does not mean that products are safe just because they're labeled "natural". Many herbal supplements contain active ingredients that can harm you if taken with certain prescription drugs. Always check with your doctor before using any herbal or natural supplement. There are few natural home-made remedies and treatments that are worth mentioning. One of them is Indian gooseberry (Amla). Used either as oil or powder to make paste and rubbed on scalp. It can be use as it is or mixed with conditioner. This fruit contains essential fatty acids, vitamins and minerals that helps to strengthen hair follicle and been mentioned in many publications to prevent and even “reverse” gray hair. So far it was all about preventing gray hair, but lets look at advancement made in one of the most common solutions - Covering Gray hair. DeveloPlus (developlus.com) announced a product that when mixed with a home hair-coloring product, it adds additional pigments to the color mixture and helps the hair color to penetrate the hair fiber more effectively. 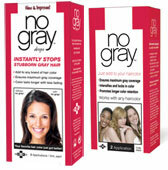 No Gray is specially formulated to mix with hair dye or tint (permanent or semipermanent color) and will keep the gray from breaking through for up to six weeks. According to DeveloPlus, this new additive works with any oxidation hair color and any hair type (Afro American Hair type included), but for those stubborn gray hair, they do recommend using either double amount of product or using a special cover gray developer by developlus. Source:Aki Tsukioka, JCNN July 26, 2004Shiseido and Kirin Brewery Research: Hop Extract May Stop Hair Turned to Grey - Los Angeles, CA (PRWEB) July 27, 2004Hair Care Professionals Now Hold The Key To Naturally Reversing The Process Of Balding And Graying Hair - January 13, 2011, makiko sadaka Ltd - Revolutionary Solution to Restore Grey Hair to its Original, Natural Colour - BBC.co.uk, 27 May, 2004, 15:11 GMT 16:11 UKCould a pill prevent grey hair? - CORONA, Calif., April 30 /PRThe Frustration Is Over for At-Home Hair Colorists: There Will Be No Gray!